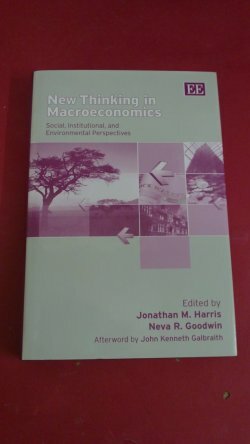 Edited By Harris, Jonathan M; Goodwin, Neva R.
Presenting new and innovative perspectives on macroeconomics at the national and international level, the editors bring together contributions on a wide range of topics including: social, institutional and environmental perspectives; current issues of globalization; transitional economies; inequity; unemployment; national and international debt; and the relationship of macroeconomic policies to the environment. The contributors draw on expertise in a variety of areas to provide insight into debates on macroeconomic policy in the US and Europe, as well as in developing and transitional economies. Themes include: disequilibrium in the macroeconomy - analysis of the roots of instability and crisis in national and global systems; the evolution of macroeconomic institutions to stabilize and guide economic growth; the paradoxes of globalization, the dangers of unrestricted financial flows and the impacts of globalization on national institutional coherence; macro and institutional strategies for the transitional economies of Russia and Eastern Europe; distributional and equity issues, including employment, housing and homelessness; the impact of macroeconomic policy and debt on the environment; and long-term growth and its relationship to well-being and environmental sustainability. 259pp. n.B. Slight scratch to rear D/J.